﻿ What is QSFP+ Optics Transceiver? QSFP aslo called QSFP+, it is stand for Quad (4-channel) Small Form-factor Pluggable Optics Transceiver. It is a compact, hot-pluggable fiber optical transceiver used for 40 Gigabit Ethernet (40GbE) data communications applications. It’s designed according to QSFP+ Multi-source agreement and IEEE802.3ab, they are usually for the application of Data center, 40G Ethernet, Infiniband, and other communications standards. It interfaces a network device (switch, router, media converter or similar device) to a fiber optic or copper cable. It is an industry standard format defined by the Small Form Factor Committee (SFF-8436, Rev 3.4, Nov. 12, 2009—Specification for QSFP+ Copper and The CFP MSA was formally launched at OFC/NFOEC 2009 in March by founding members Finisar, Opnext, and Sumitomo/ ExceLight. The format specification is evolving to enable higher data rates; as of May 2013, highest supported rate is 4x28Gbps (112Gbps) defined in the SFF-8665 document (commonly known as QSFP28) which will support 100GE. The QSFP MSA specification supports Ethernet, Fibre Channel, InfiniBand and SONET/SDH standards with different data rate options. The QSFP Multi Source Agreement (MSA) document specifies a QSFP optic transceiver mechanical form factor with latching mechanism, host-board electrical edge connector and cage. 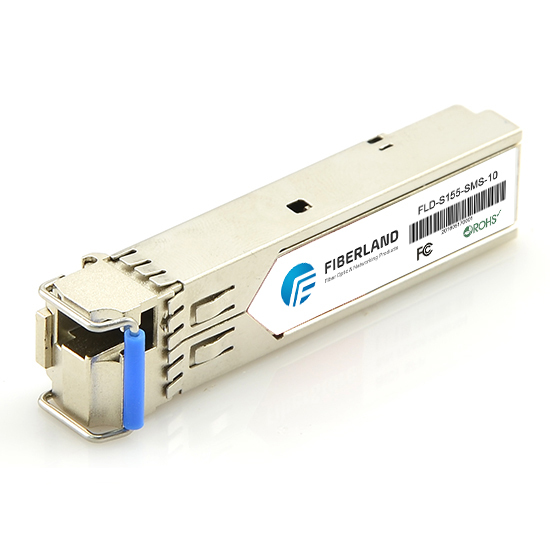 QSFP+ optic transceivers are designed to support Serial Attached SCSI, 40G Ethernet, 20G/40G Infiniband, and other fiber optic communications standards as well as copper cable media. The QSFP optic modules highly increase the port-density by 4x compared to SFP+ optic modules. Fiberland provides a full range of both copper cables,active optical cables and optical transceivers for 40GbE, compliant to the IEEE standards.